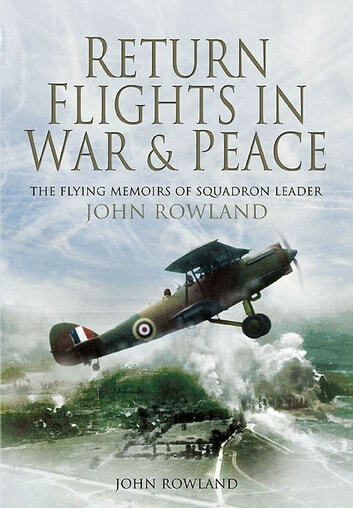 John Rowland made his first flight with the RAF Volunteer Reserve on 1 October 1938 from Redhill in a DH60 Moth. He won a Prize Cadetship to the RAF College Cranwell and then posted to the School of Army Cooperation. He volunteered for 613 Squadron which had been formed shortly before the war started. It was still not fully equipped with Lysanders and half of its planes were still elderly Hectors. On 25 May 1940 came the news that six Hectors were to be sent off on a ground strafing operation to relieve the pressure on the garrison of Calais which was blocking the Germans from advancing up the coast towards Dunkirk and encircled by German troops Three Hectors flew on each side of Calais and created as much of a diversion as they could by dropping bombs and firing their guns at anything they could see. This was the only occasions on which such obsolete aircraft was used in Europe in WW2. He converted to heavy bombers and was posted to 12 Squadron at Wickenby flying Halifaxs in June 1943. On 3 July he made his first trip to Cologne, Germany. After he had flown 28 operations he was promoted to Squadron leader as a flight Commander at 1656 HCU at Lindholme. He was next posted to 625 Squadron as a flight Commander on 12 May 1944. It was a two flight Lancaster Squadron. The last of his 48 bomber operations was to Calais, the town to which he made his first operational flight in the Hector in 1940. After the war John flew as an airline pilot with BOAC.